Random House Trade Paperbacks, 1978-04-01. Paperback. Used:Good. Paris: Librairie Hachette & Cie, 1875. Relié. Etat satisfaisant. in-8°. 2ème édition. 1806 pp. Demi reliure cuir usée, frottée, avec un petit accroc sur le haut du dos. Coins usés. Tampons et annotations de bibliothèque. 1989-08-02. Good. Ships with Tracking Number! INTERNATIONAL WORLDWIDE Shipping available. May not contain Access Codes or Supplements. May be ex-library. Shipping & Handling by region. Buy with confidence, excellent customer service! Random House, 1989-10-03. 2 Sub. Hardcover. Used:Good. 1983-06-02. Good. Ships with Tracking Number! INTERNATIONAL WORLDWIDE Shipping available. May not contain Access Codes or Supplements. May be ex-library. Shipping & Handling by region. Buy with confidence, excellent customer service! 1978-04-01. Good. Ships with Tracking Number! INTERNATIONAL WORLDWIDE Shipping available. May not contain Access Codes or Supplements. May be ex-library. Shipping & Handling by region. Buy with confidence, excellent customer service! Random House. Hardcover. 0394576691 Like New Condition. . Fine. Random House. Hardcover. 0394576691 New Condition. . New. Vintage. PAPERBACK. 039472562X New Condition. . New. Random House Trade Paperbacks. PAPERBACK. 0394500415 New Condition. . New. London: Chatto & Windus, 1965. Cloth/no dust jacket Octavo. Hardcover. Good/good. 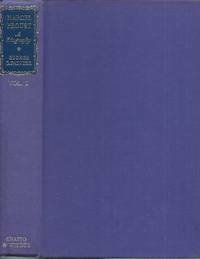 volume 1 blue and white designed covers with red labels illustrated dust jacket 351 pp volume 2 purple cloth gilt lettering no dust jacket 424 pp. Random House, New York, 1989. Hardcover. Good. New York: Random House, 1978. First American Edition. Hard Cover. Fine/Fine. 8vo. Volume I. [ISBN 0394500407] xvi (iv), 351 pp, preface, 16 chapters, index. Volume II. [ISBN 0394500415] (5), 424 pp, acknowledgments, list of b&w plates, 17 chapters, bibliography for Vols. I and II, references to sources, corrections and additions, references to sources, indexes for Vol. and II. First published in England in 1959. This is the First American Edition, 1978. Price clipped. Inked name on ffep, volume I, else, Pristine, no wear. Clean, tight and strong binding with no underlining, highlighting or marginalia. Black cloth with gilt lettering to spine. New York: Random House. Fine in Fine dust jacket. 1959. First US Edition; First Printing. Cloth. 0394500415 . A first Printing of the First American Edition that is Fine and housed in a like dust-jacket; Vol. 2 . New York: Random House. Fine in Fine dust jacket. 1959. First US Edition; First Printing. Cloth. 0394500407 . A first Printing of the First American Edition in Fine condition and housed in a dust-jacket of equal value; Vol. 1 . Penguin Books Ltd. PAPERBACK. 0140132961 Satisfaction Guaranteed. Please contact us with any inquiries. We ship daily. We only ship Internationally via FedEx with tracking which is why our shipping price might be higher than others. . Good. London: Chatto & Windus, 1959. First Edition. Near fine copy in the original publisher's gilt-blocked cloth, edges very slightly toned. Corners sharp with an overall tight, bright and clean impression.
. Physical description; 351 pages. Subjects; Marcel Proust. Genre; biography. Random House Trade Paperbacks. PAPERBACK. 0394500415 Like New Condition. . Fine. Vintage. PAPERBACK. 039472562X Like New Condition. . Fine. Pimlico, 1996. Paperback. Acceptable. Disclaimer:A readable copy. All pages are intact, and the cover is intact. Pages can include considerable notes-in pen or highlighter-but the notes cannot obscure the text. At ThriftBooks, our motto is: Read More, Spend Less.Dust jacket quality is not guaranteed. Chatto & Windus, London, 1989. 446 pp including index, maps on end-papers, b&w photographic plates, fine copy in like, illustrated d/j.. 2 volumes in 1. Revised and enlarged edition. New York: Random House Volume 1. xvi, + 351pp. B/white map and illustrations. Book clean, square. Spine firm, gilt title there-on. Black cloth boards undamaged. Faint tanning to endpapers, else leaves clean and unmarked. Illustrated, loose-plastic protected dustjacket negligibly edge-creased, faintly tanned on reverse (inner) surface. Contents include: Preface, 16 chapters, Index. Volume 2. 424pp., b/white map and illustrations. Book clean, square. Spine firm, gilt title there-on. Black cloth boards undamaged. Faint tanning to endpapers, else leaves clean and unmarked. Illustrated, loose-plastic protected dustjacket negligibly edge-creased, short closed tear to front panel, faintly tanned on reverse (inner) surface. Contents include: 17 chapters, Bibliography, Vols. I & II, References to Sources, Vol I, Corrections and Additions, Vol. I, References to Sources, Vol. II, Indexes, Vol. II. Combined weight 1.2 KG. *Customers outside Australia - This item will incur extra postage charges as it weighs over 1KG. Please email for quote. . Hardcover and Dustjacket. Very Good +/Very Good. 8vo - over 7¾" - 9¾" tall. London: Chatto & Windus Two volumes in slipcase. Reprint. 351, 424 pp., illus. Both volumes have crowns lightly pulled, page edges tanned and lightly soiled; Vol. 1 spine slightly cocked. In clear acetate jackets, that of Vol. 1 with pieces missing. Slipcase worn and beginning to split at top seam. Size: 8vo. Hardcover. Very Good/No Jacket. Marcel Proust: A Biography (Two Volume Set). New York, NY Random House: Vintage, 1978. Paperback First Edition Thus , so stated. First Edition Thus , so stated. Volume 1 Very Good- in Wraps; Volume 2 Very Near Fine in Wraps: both volumes show indications of very careful use: Volume 1 shows very mild rubbing to the wrapper covers; the barest hint of wear to the outside edges, some faint creasing to the backstrip; the binding leans well off square, but remains perfectly secure; the text is clean. Volume 2 remains close to 'As New': a scuff near the upper corner of the front panel and, again, the barest hint of rubbing to the corner tips; a small, faint stain at the top edge of the rear panel; a couple very faint creases at the backstrip; the pages have tanned slightly; the binding is square and secure; the text is clean. Both volumes show slight tanning to the text pages, due to aging. Both texts are free of any underlining, highlighting, or marginalia. Free of any ownership names, dates, addresses, notations, inscriptions, stamps, plates, or labels. Overall, Very Good+: a handsome set: structually sound and tightly bound: the first volume with a significant flaw, the second Near New. Both are clean, sturdy, and quite presentable. NOT a Remainder, Book-Club, or Ex-Library. 8vo. (8 x 5.2 x 2.15 inches). xiv, pre-text maps, 775 pages. Weight: 1 pound, 14 ounces. ISBNs: Volume 1: 0394725611; Volume 2: 039472562x. Trade Paperback. Chatto & Windus. Used - Acceptable. Ships from the UK. Former Library book. Shows definite wear, and perhaps considerable marking on inside. 100% Money Back Guarantee. Your purchase also supports literacy charities. Random House, 1989-10-03. Hardcover. Good. Random House, 1959. 351pp. Black cloth hardback with DJ, VG, Volume One Only, remainder mark on bottom page edge, indices, footnotes, b&w photos, Biography of French novelist Marcel Proust, . Hard Cover. Very Good/Very Good. Random House Publishing Group, 1989. Hardcover. Good. Disclaimer:A copy that has been read, but remains in clean condition. All pages are intact, and the cover is intact. The spine may show signs of wear. Pages can include limited notes and highlighting, and the copy can include previous owner inscriptions. An ex-library book and may have standard library stamps and/or stickers. At ThriftBooks, our motto is: Read More, Spend Less.Dust jacket quality is not guaranteed. London: Penguin, 1977. Two Volume Box Set in case.Small plain label inside cover.. Paperback. Good/No d/j as Published. 8vo - over 7¾" - 9¾" tall. Chatto & Windus, 1989. 446pp Plates. Endpaper maps. Some light pencil marginalia Size: 8vo. Rev.Edn.. Hardcover. Vg/G+. Random House, October 1989. Hardcover. Very Good-/Good. used hardcover with dust jacket. dj covers lightly scuffed, no tears, not price-clipped, though just slightly faded at spine. pages and binding are clean, straight, and tight. there are no marks to the text, previous ownership marks or other serious flaws. Paris: Mercure De France, 1966. In 2 volumes: Vol. 1 1871-1903 Les Annees De Jeunesse; Vol. 2: 1904-1922: Les Annees De Maturite; Illustrated with black and white photos; In French. Covers yellowed with some splitting along hinges but sound and very clean and bright internally;. `. First French Edition. Wraps. Good/No d/w. 12mo. London: Chatto & Windus, 1965. Cloth/no dust jacket Octavo. Hardcover. Very good. volume 2 only, purple cloth, gilt lettering to black label, no dust jacket, 424 pp. London: Penguin Books, 1977. Paperback Octavo. Paperback. Good/fair. wraps, two volumes, cardboard slipcase repaired with tape , 334/435 pp 014055131x, 0140551328. London: Chatto & Windus, 1965. Cloth/no dust jacket Octavo. Hardcover. Very good. volume 1 only, purple cloth, gilt lettering to black label, no dust jacket, 351 pp.